North Free­dom Repair is a fam­i­ly owned and oper­at­ed auto and truck repair shop. We have been in busi­ness since 1994. Our auto tech­ni­cians are hand picked experts. Their spe­cial­ties cov­er all auto­mo­tive needs you may think of. Let’s intro­duce the own­er, and each auto tech­ni­cian and staff mem­ber who works for us. auto­mo­tive indus­try when he real­ized that job oppor­tu­ni­ties in the air­craft indus­try were only in large cities. He how­ev­er chose to stay in a small com­mu­ni­ty where he could get to know his cus­tomers and stay close to his fam­i­ly. Before start­ing his own busi­ness, Al worked for the Ford deal­er­ship in Sauk Prairie from 1970 – 1994. He worked as an auto tech­ni­cian and ser­vice man­ag­er of the truck shop. Al enjoys the chal­lenges and free­doms that own­ing his own busi­ness allows. Al, the own­er, is our expe­ri­enced leader! He is very knowl­edge­able, and always ready to lend a hand. He has worked in this indus­try for 44 years and believes in run­ning an hon­est busi­ness. 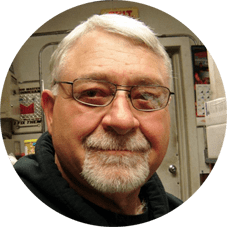 Mark is our Mas­ter Diesel Tech­ni­cian. He repairs light and medi­um diesel engines. He has had 34 years in the busi­ness as a pro­fes­sion­al. His knowl­edge of the elec­tron­ic sys­tems of the auto­mo­tive indus­try is exten­sive. Bri­an is our under car spe­cial­ist. No job is too big or small for him. Eric­ka is our office man­ag­er. She is avail­able to greet you with a smil­ing face, or to answer any ques­tions you may have over the phone.